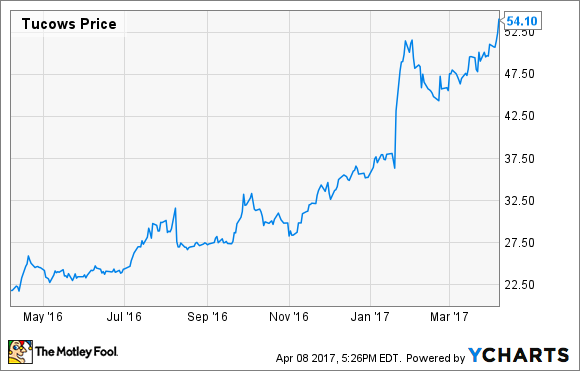 Is Tucows the Best Small-Cap Growth Stock You've Never Heard of? This under-the-radar company is executing its unique playbook to perfection. With a market cap around $600 million, Tucows (NASDAQ:TCX) doesn't generate a lot of headlines. (In fact, just three analysts joined the company's most recent conference call.) But with its shares rising 140% over the last 12 months, you can bet more and more people are beginning to notice this Canadian company with a peculiar name. Tucows -- yes, its logo includes two cows -- says its mission is to "provide simple, useful services that help people unlock the power of the Internet." In a nutshell, the company operates a large Internet domain registration business, as well as smaller mobile and fiber internet businesses. From 2012 to 2016, Tucows' revenue increased from $114.7 million to $189.8 million -- a compound annual growth rate (CAGR) of around 13.4%. As a result of the significant operating leverage in its lean business structure, its bottom line grew nearly three times as fast over the same period, from $4.5 million to $16.1 million -- a 37.3% CAGR. A couple other highlights from 2016 show more strong performance. Owing to rapid expansion of the company's mobile business, adjusted earnings before interest, taxes, depreciation, and amortization (EBITDA) increased 43% last year to $30.1 million. And perhaps most importantly to the company's long-term strategy, the company produced substantial cash flow from operations of $21.6 million in 2016, a 62% increase from the prior year. Tucows says it is the second-largest domain registry in the world, behind only GoDaddy. While the company does sell domain names directly to consumers and businesses, the lion's share of revenue in this segment comes from registration fees charged to resellers. Tucows has grown its domain businesses substantially over the years through a series of acquisitions. The latest was announced in January, when TuCows agreed to purchase eNom for $83.5 million. As an example of how Tucows wrings efficiencies out of these acquisitions, eNom was generating around $15 in annual EBITDA at the time of sale, but Tucows believes it will be able to grow this to roughly $20 million within two years. Domain services is Tucows largest segment, comprising 61% of the company's total revenues. While organic growth is not expected to be robust, the domain business throws off large, reliable amounts of cash, (the company has had 14 consecutive years of positive cash flow from operations ) which Tucows then uses to invest in its other, faster-growing segment. Tucows' other segment includes a fast-growing mobile business, as well as its nascent high-speed internet division. Ting Mobile launched nationally in 2012 and offers phone service at deep discounts, with the company saying an average monthly bill is about $23 per device. All of Ting's services are provided on a pay-as-you-go basis with no fixed contracts. The company also boasts top-notch customer service, reporting a "net promoter score" -- which measures customers' enthusiasm for a business -- of 73, which it says is on par with beloved tech companies Amazon (69) and Apple (76) and far above the 16 of the broad category of mobile phone providers..
At the end of 2014, the company had 94,000 Ting Mobile subscribers. By the end of 2016, that number had risen more than 60% to 151,000. With that kind of meteoric growth, and with Ting Mobile's gross margins of around 50%, it's easy to get excited about the company's efforts to scale this business up. Mobile services revenue for 2016 grew 22% to $70 million, which was 37% of the company's total revenue. Then there's Ting Internet, launched in 2015, which provides high-speed fiber internet access to a few small towns -- Holly Springs, North Carolina; Westminster, Maryland; and Charlottesville, Virginia. While deep-pocketed broadband providers like Comcast and Verizon are competition, Ting believes it offers much better value, and like its mobile sibling, offers services on a monthly basis with no fixed contracts. Ting Internet is tiny at only 2% of revenue, but it's also just getting started. Ting plans to add service to Centennial, Colorado, and Sandpoint, Idaho, in 2017, and it expects to announce plans for additional towns later this year. In its first year of launching Ting Internet in a community, the company expects 20% uptake, growing to 50% uptake within five years. And while Ting Internet is not yet profitable, the company is targeting late 2018 or early 2019 as its breakeven point. Tucows has been rewarding shareholders by buying back massive amounts of its own stock -- around 50% of total shares since 2007. In addition, in February the company announced its latest buyback program, planning to repurchase up to $40 million worth of shares over the next 12 months. This represents 7% of Tucows' market cap at current prices. Tucows strategy of milking its core domain business to fund its higher-growth mobile and internet ventures has provided some incredible returns for shareholders. But keep in mind this is a pricey small cap with lumpy earnings, and has been growing heavily through acquisitions. In other words, expect plenty of volatility. While it may be a bumpy ride, so long as the company continues to execute, Tucows growth prospects continue to look mighty appetizing.